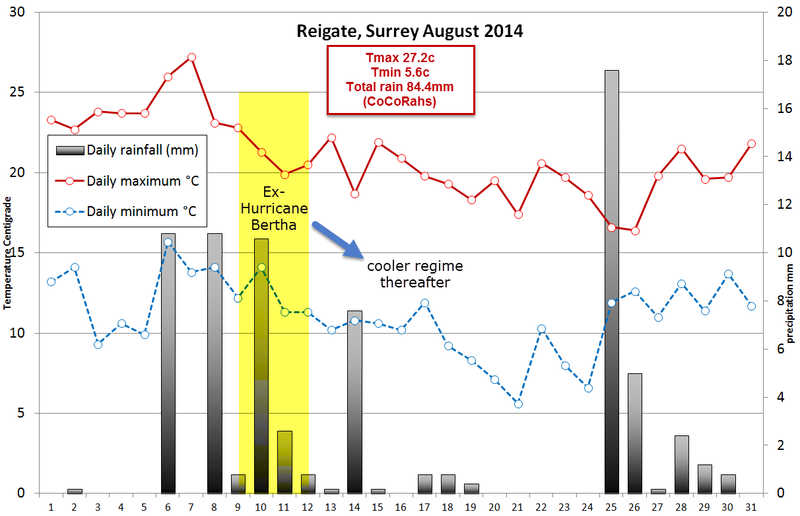 #Reigate August weather summary: cool and wet summers the new normal? 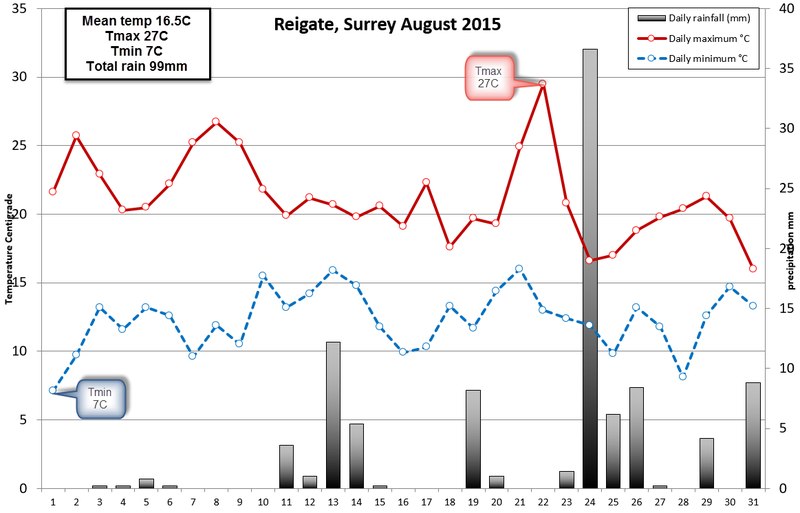 August in Reigate, like the rest of Southern and SE England, came out slightly cooler than average at nearly 17C with about twice as much rainfall than the long term average with a rainfall total of 100mm. (Possibly* half of this fell in one deluge on 24 August when the town centre flooded quite notably from intense rain falling in a few hours (see post below)). Across SE England the MetOffice official records showed the rainfall total of 103mm was 177% of the August 1961-1990 long term average, so nearly double the usual total in some locations, especially near the south coast (100% being the average monthly total for August in this case). Don’t forget that August is often a wet month and that August 2014 had 84mm. Nevertheless, if you think our Summers are getting cooler and wetter then, yes, you could well be right! Read on to find out more. The mean 500mb pressure pattern for August above shows a deep trough in the Atlantic, dug unusually far to the south for the time of year, and a continuation of the dominant high pressure over Europe from July, nudged further east maintaining the heat wave in Europe, especially Central Eastern Europe. This looks like it should have promised a hot August for SE England with an average upper flow from the south and a surface mean flow from the SE. Unfortunately this pattern did not deliver any heat of note, but it did deliver occasional heavy showers and some thunderstorms, with notably torrential rain showers delivering big precipitation totals in a matter of hours. Despite the average southerly and SE flow bringing occasional thundery Spanish Plumes, the real heat stayed stubbornly on the continent and only fleetingly wafted temperatures exceeding 25C across the SE. While France regularly baked in 30C+ daytime heat, Reigate and the SE could only struggle to Tmax temperatures of 25C and only once nudged 30C. Notably, the mean temperature was a tad below the 1981-2010 average but above the 1961-1990 average, showing how recent decades have been warmer. So August was either above or below the long term average, depending on what LTA you choose. This is a small example of how weather statistics can be presented by the media to suit any argument regarding climate change. The August monthly Central England Temperature (CET) came out at 0.1C above the long term average but this hides the cooler than average Tmax attained in a disappointing month. This again illustrates how headline figures hide many subtle interpretations of weather statistics. Overall, August was nearly average from the perspective of long term Central England Temperatures, with the East coming out slightly above average compared with a cooler West. 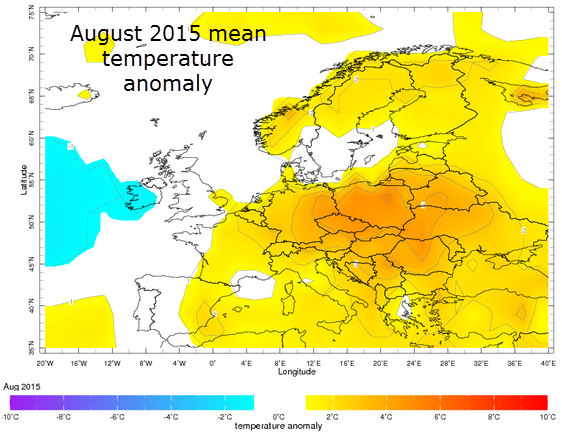 Maximum temperatures were widely lower than usual for August. At 116.4 hours, sunshine was also only average or a tad below the 1961-1990 average. The dominant wind direction this August was from the SOUTH (i.e. a southerly wind). 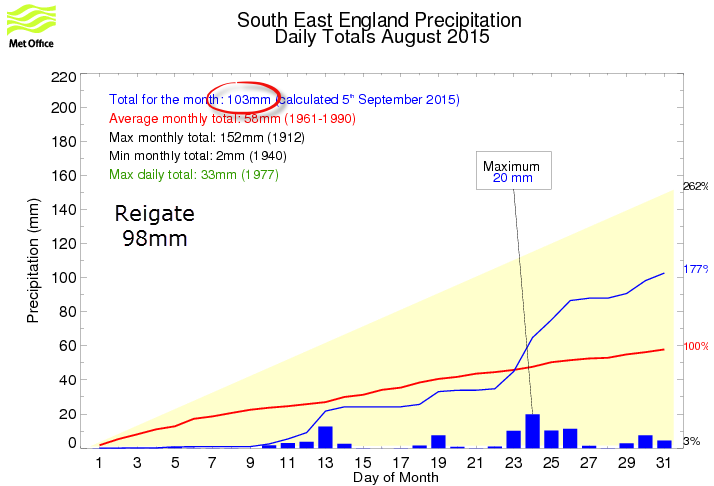 The highest rainfall totals experienced in Reigate are brought, on our 4 year “long term average”, by southerly winds. This makes sense because mean southerly winds are from warm source regions, travelling across Biscay and the Channel, and are frequently associated with humid warm sectors that precede fronts where heavy thundery showers can occur. Our more frequent prevailing Westerly / SW winds bring our familiar frontal rain but this often peters out before reaching the South East as most rain is dumped over the western hills of the UK. In contrast, warm southerly winds containing more water vapour arrive laden with precipitable water (PWAT) ripe for torrential convective downpours across Southern and SE England. The Downs (both the North and especially the South Downs) can also have a marked orographic effect enhancing this southerly rainfall pattern, whereas they have little impact on frontal rain from the west. 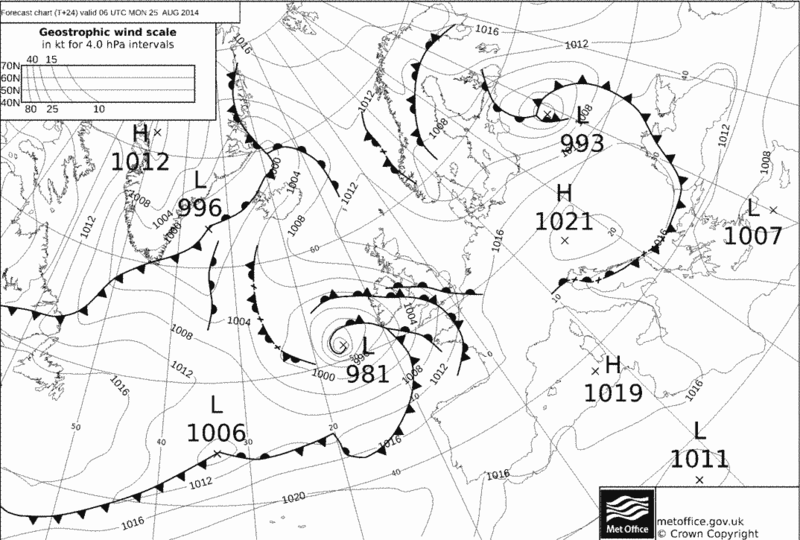 This warm humid southerly set-up was responsible for the Reigate deluge on 24 August, also known as a Spanish Plume. 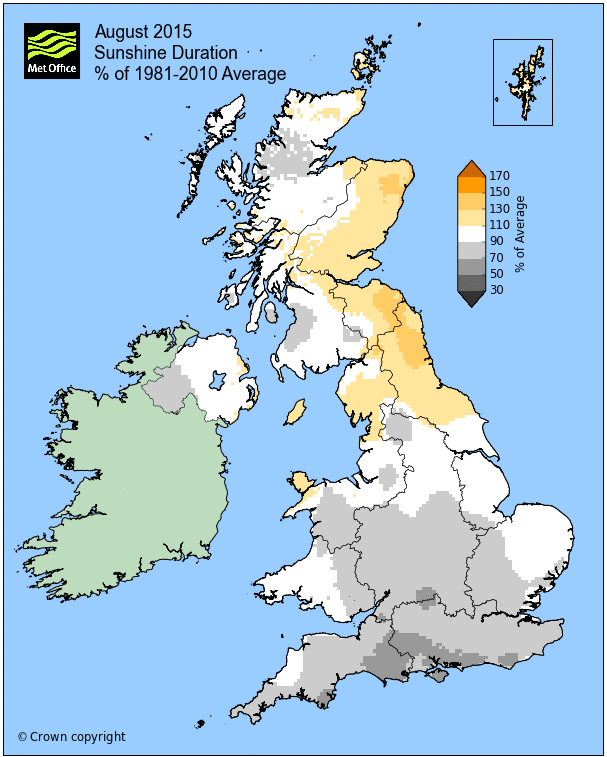 Finally, research shows that UK Summers have got cooler and considerably wetter since 2000. Cooler by just 0.4C (this despite some warm years) but total summer precipitation has increased by some 50mm over the last 15 years and the 10 year moving rainfall average is on the rise, most likely due to torrential rainfall events. This change to rainfall being delivered in torrential but sporadic events is in-line with climate change predictions. Rainfall challenge! *Our local rainfall totals are proving mighty tricky to verify at the moment. We use three sites for measuring rainfall locally: an automatic tipping bucket rain gauge at RGS, a manual CoCoRaHs rain gauge at the same site and a local sister site in town. Unfortunately they rarely agree and sometimes vary quite considerably. Also, the manual rain gauge is used to measure monthly totals because emptying it everyday (during the holidays for example) is not always possible. Calibration of the AWS and regular rain gauge measurements is therefore an immediate target. Meanwhile, all rainfall figures are available on request and posted in these summaries along with official MetOffice rainfall figures for the South East. Bank Holiday heavy rainfall wash out! Like much of the rest of England and Wales, Reigate and Surrey and the SE will see an August Bank Holiday wash-out tomorrow with lots of rain through the day, likely to be heaviest in the afternoon. This has the potential to be a moderately severe wet weather event with 48 hour rainfall accumulation possibly topping 20mm in our region with some models taking this even higher to 30-40mm in places but this is probably over-egging things. The WRF and NMM models push totals to 40-50mm in places while Hirlam and Euro4 (UKMET) keep a lid on rain at 20-30mm. Anything approaching 40mm in 48 hours would be highly unusual for us in SE in Atlantic frontal depressions but it’s by no means impossible. Remember that a “wet day” for us in the SE usually adds up to only around 10mm, so any totals over 20mm tomorrow will seem a significant deluge. Check the rogues gallery of models below for the worst rainfall offenders. By the way, always Check the UKMET forecast for a professional look at the situation, this site is for a local perspective on weather and to generate enthusiasm and interest and share some more understanding of the air around us, especially in these times of such uncertainty regarding weather and climate. As we approach another autumn and winter please share any of your weather stories and photos here or follow us @RGSweather on twitter. Twitter is an amazing portal for sharing, learning and discussing the amazing fast moving world of weather… join it if you can. Either way, surface water local flooding is likely to be a feature on roads tomorrow and the UKMET has issued a yellow warning for heavy rain. You can expect a cloudy, dull, blustery, cool and wet day: so maybe snuggle up with the TV guide and check out some bank holiday films 🙂 and watch @RGSweather on twitter for exciting weather updates of course! The bank holiday soaking is courtesy of a low pressure in the Atlantic set to deepen to 981mb overnight as an unseasonably fast jetstream blasting through the Channel draws very moist air from the surface and lowers the surface pressure throwing all types of fronts our way and tightening isobars cross the SE during the course of the day. Today, the system lurked in the Atlantic as a significant band of cloud, as shown here by the VIIRS satellite at 13:00hrs. 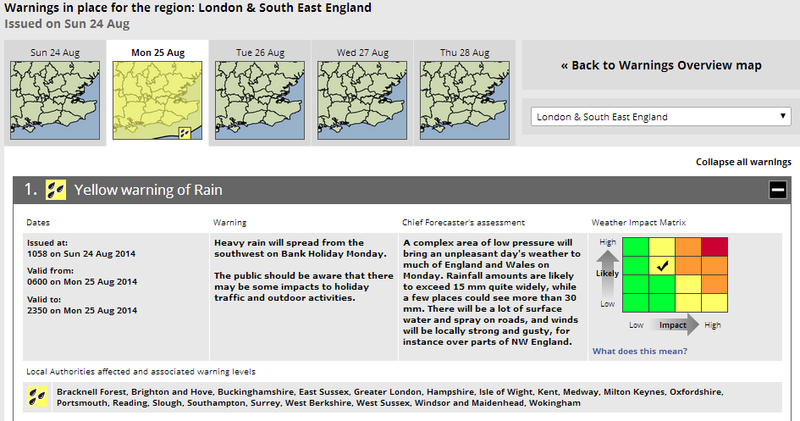 The system will bring rain first thing tomorrow to Reigate. Initially rain looks to remain fairly light but will become progressively heavier through the day with even a low risk of heavy thundery showers as the cold front passes later pm and into Tuesday night (updated) before things gradually calm down Tues am. Whilst breezy through the day, max wind gusts are likely to arrive later in the afternoon but only 20mph. This is certainly more a wet event than a wind event! 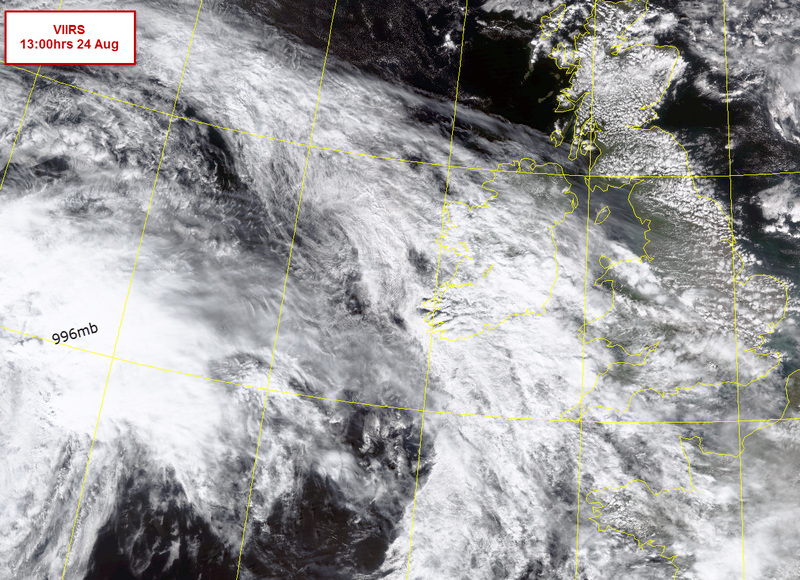 Satellite pics show a rapidly developing occluded low pressure with tightly wrapped fronts. The dark are on the sat pics represents high altitude air that is subsiding (sinking) into the depression. This dry intrusion can cause increased instability around the cold front where it is forced to rise once more nearer the surface, increasing cloud formation. Sometimes is can cause thundery doinwpours and some of the models are picking up on this by increasing rainfall totals even further for the SE as the frontal system passes over. Interestingly this does not count as a “bomb” cyclogenesis which requires a 24mb fall in pressure over 24 hours (1mb per hour). This has managed about half that pressure fall so far. August had 37.6mm of rainfall (July 23.6mm), with more than 20mm falling on just three days: 5th, 22nd and 24 August. The maximum temperature of 33.5C (July 33C) was recorded on 1st August, hottest in the UK equivalent to Heathrow, the official warmest! The minimum temperature of 9.7C (July 9.6C) was recorded on the 24 August. 157 sunshine hours were recorded by our new solar sensor, way short of the 213 hours recorded in July. 12 rainy days were recorded in August with 10 rainy days in July. 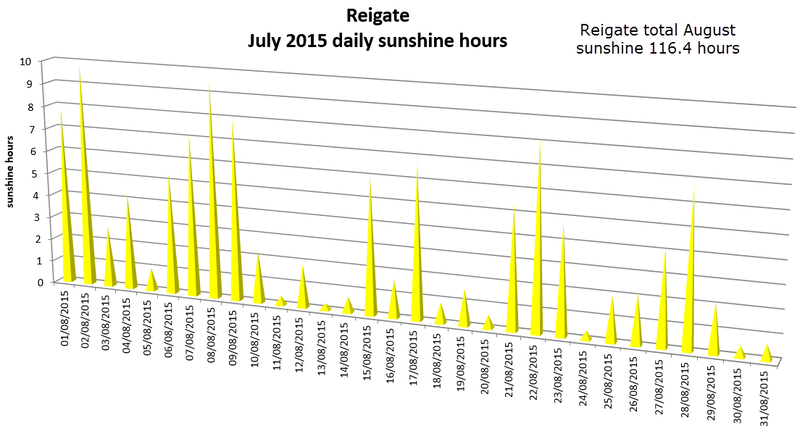 The pictures show that August continued the excellent summer we have had in Reigate. 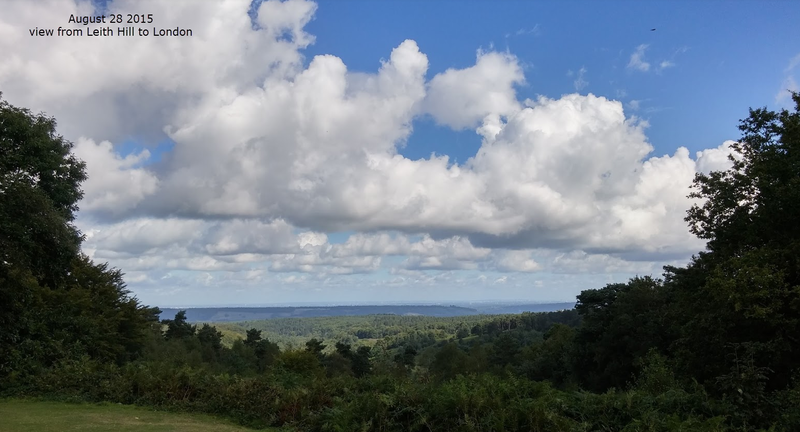 Reigate has some of the warmest, driest and most pleasant weather of any part of the UK.